There's tons of great advice already so I only have a few things to add/emphasize. 1. Cover your windows on the OUTSIDE with plastic and painters tape either just be arriving on playa or when you arrive. If you plastic from the INSIDE dust will still get through the vents/cracks/whatever miniscule openings and fill the plastic with dust so that when you take it off, it all comes off inside. 3. Position your rig so that your entry door won't get ripped off by the wind when you open it. There are some maps of the playa online that show the typical wind directions. 4. Be courteous of your generator use. It's noisy. That being said, we run two of the quieter Yamaha generators in parallel that are locked into the bed of our truck. See attached picture. Our power cord reaches from the truck to our trailer. We covered them which helps redirect the sound and protects them a bit in case of rain. Do a search for hush boxes or similar for many different ideas on making generators quieter. Just make sure you have plenty of room for airflow. If you're careful to keep the sun/heat out of your RV your generator use should be minimal. We were also able to use our generator cover as a place to put our solar panels to power our RV batteries. 5. Consider how much fuel you will need to get to the playa and back from where your last fill up was (Fernley or Empire perhaps), how much fuel you may need to use with generator use, and how much may be spent waiting in line to get in/out of the event. It's smart to carry some extra fuel with you when you. 6. Be careful how much crapping is happening in your toilet. The heat and the duration that you're out there can make things unpleasant. Make sure you have a great digester/deodorizer product for your toilet/black water tanks and grey water tank. Take a few dumps in the portapotty to lessen the load & smell in your tanks. 7. Don't hide out in your RV. Create an inviting space within your camp to say hello and welcome any guests. 8. Gift the benefits of your RV to your camp mates or neighbors - if you have a blender then making a nice refreshing drink can be great or a batch of brownies or cookies. missmelee wrote: There's tons of great advice already so I only have a few things to add/emphasize. Life is all about the ride...enjoy it !!! Yeah, getting pumped can be a challenge. There's two of us and we're very conservative so we just empty our tanks when we get off playa. We haven't had to flag down a truck for on playa pumping. All depends on duration & quantity of showers and dish washing and how often the toilet is being used. If your actively cooling the rv. Use foam board over all the windows (maybe leave one or two that u enjoy looking out of). Windows have almost no R-value and they make a good percentage of area, so adding a 7 R-value over a window makes a dramatic difference. don't rely on the stated watts from the generator, or how much you need from the a/c. I have two Yamaha knockoffs, supposed to provide 2000 watts each, and my a/c is supposed to need 2500 to 3000 to turn the compressor. doesn't happen like that. Boo! I installed a hard start capacitor on my a/c, and problem is solved! The handbasket to hell is leaving. Hop in world! Last year was our first burn and we felt like we handle it well with the RV. We were on the Playa for 9 days. 1) Reflectix on the outside (every piece of glass) with a good blue tape, never came off until I pulled it and it left no residue. That was a home run! Also used blue tape to seal any open seams (around doors, vents....). 2) We only used the generator when we cooked and ate. The RV cooled down quickly. It was cool enough at night we did not need any power. Just a nice thick, cushy blanket and then light up the generator when I got out of bed to warm it up a bit. 3) We figured out before we got there we were not going to be able to use the refrigerator in the RV. The aux batteries were not charging which the propane refrigerator needed to light the propane off. So we bought ice and kept the cooler filled. 4) Water run off from the ice was used to flush the toilet. It allowed us to keep count of how many gallons of water we dumped in. We started with clean gray and black water tanks as we dumped at the Vegas KOA the night before we arrived at the Playa and did not use the RV toilet or water until we got to the Playa. When we got to the Playa, we had about 7/8 of a tank of gas. At the end of 9 days we had just under half a tank. Plenty left. The thing is, you never spend time in the RV anyway. At least, we didn't, but then again, I think last years temperatures were really mild. At least, I thought they were. I was comfortable the whole time there. If anything, it got a bit chilly at night. We felt we prepared well and as a result we had a great time and never once worried about anything. Wish we could make it this year. OK, so does the Reflectix go on the inside or the outside? I have seen both recommended. Outside, that way the window glass and aluminum frame around the window never get direct sun heat to transfer inward. I tried this last year with something similar with bad results. Anything less than a HEPA filter will allow the playa dust to pass thru. I will be using HEPA this year. Yea, that media is way to porous. You would be better cutting up a pleated filter, tape up the edges and tape in place. Allergy rated filters catch the most I believe. This was my first trip ever in my small travel trailer. I didn't bring my small camp stove because,hey, the trailer has a whole kitchen. I never felt like sitting inside and using the stove so I just didn't use it. I wished I had brought the camp stove to use outside on the table. Yea, gotta bring the camp stove. The only time I use my RMC stove is if its too windy (like really windy) or too cold. Camp Name: I don’t know!!! Jackass wrote: Start all of your practicing and trying right now! Don't wait another minute. Make sure all of the things work and know how to use them. Well, we do not pick up the RV until Thursday of next week and roll out on Friday. I have downloaded and printed the owner's manual and will make sure everything is working when we pick it up. The Wife will get familiar with the things as I clean and poly seal the exterior and treat the rubber seals. If we have time, we will cut the Reflectix for all the windows before we leave. We have all our bins packed and inventory listed. RV should load up pretty quickly. I have mapped where everything goes as we went and took pictures and measurements a few weeks ago. Hi all... not my first burn, or RV at a burn, but definitely my first time in charge of dust-protection. I've read every thread and list of tips I can find. I think I have a solid plan: Reflectix, Blue Painters Tape, All seams, vents, and windows. Plastic on the floor, more tape, held down w/ rubber mats. Extra sheets on the beds, couches, dash. Cab blocked off by more plastic & tape. No awning, doors closed, shoes off. Am I missing anything? Any tips on how much Reflectix one might want for all of the windows in a 28' RV? Are there any pieces we shouldn't tape or cover before or while the vehicle is being driven? Don't use Gaffer's tape. You want blue painter's tape because it doesn't leave a nasty residue behind. Keep the windows uncovered for driving. Same for vents, etc.. 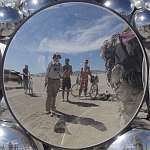 The Reflectix can wait until you're at your camp in BRC. Reflectix on the outside of widows, covering the frames too, makes a huge difference in the amount of heat that gets in. For large windows, cover in multiple pieces (install one piece, then the next taped to prior, etc.) instead of a single panel, then its taped down more. No big flat area in the middle that may get sucked off by the vacuum created by wind blowing over the RV. To maximize heat rejection and to secure the pieces into one, you can put aluminum foil tape over the tape exposed where you're joining the pieces. Reflectix on the inside works, but heats up and ends up conducting heat to the inside from the green-house and the frame. Reflectix on the inside is better than no Reflectix. Not so bad on North windows. Do not touch the Reflectix if it is in the sun - you can be burnt. For windows in the sun, if you installed Reflectix inside or are taping the Reflectix to the window frame instead of the outside surface, then the frame will get sun and get very very hot. If Reflectix is inside, cover frames outside with the painters type tape. Tape aluminum foil tape over top of the painters/securing tape (not on the RV) as a radiant barrier for the frame. This makes a surprising difference in the heat that gets inside. DO NOT use aluminum foil tape to tape anything to the RV, inside or outside. Emergency exit window(s): do not tape on the outside; do not put Reflectix on the outside. Tape on the inside can be removed so you can get out. Same for Reflectix, install on the inside and have it extend well past the frames (which will be heating the wall up). Highly recommend this window be on the North, to minimize heat gain. Same for a North window you may wish to use for ventilation during the rare moments it can be open without dust blowing in. Have a one inch hole in the Reflectix on a North window to let light in. Tape around the hole when that's on the outside so the wind can't rip the Reflectix off. Or use clear tape and tape right across. Super easy to do on a North window that has Reflectix on the inside (emergency/ventilation window). Usually too difficult to cover the roof vent/hatch from the outside, so use two or three layers of Reflectix and extend well beyond its frame to keep the frame heat out. Have a one inch hole in the middle as a light source. Cover with an additional scrap of Reflectix with a tape hinge. Cover hole when not using it as a light source - in the sun, that one inch hole will let a surprisingly amount of heat in. Actually Gaffers tape does not leave residue so it is used on movie sets by gaffers, riggers and the likes because of its friendly no-mess sticky goodness. Also it is a cloth tape so very strong. Duct tape, electrical tape and similar have the nasty sticky stuff that gets worse with heat in terms of the mess it makes. Stay away from that. Painters tape like the blue or green paper tape is also less prone to leaving residue if removed within the proscribed time period (usually the clean pull is 3 days) but I find it lacks strength. There are specialty masking tapes with 14 - 60 day clean pull but you gotta special order those. And the red Stucco Tape is the tape of choice for securing Reflectix at BRC for a few years (I forget who on eplaya first brought it up). Holds stronger than the painter's/freezer tapes, reports have it holding as well as Gaffer's in the heat, but at a fraction of the cost, and like Gaffer's, no residue. I have specs for two Stucco Tapes and a Gaffer's. The Stucco Tapes are polyethelene with synthetic rubber adhesive and are rated from 32F to 160F. (the bi-filament type used for holding hexayurts together has an adhesion of 91 oz/inch of width, and a gooey mess - do NOT use for taping your RV). Stucco Tape for the win: on spec and in use on-playa for holding Reflectix in the playa heat & wind. Inside, I used painter's for holding Reflectix. Worked fine, removed fine. Painter's tape (not from the dollar store) does fine for sealing, inside or outside. And you can even tape your vehicle's doors with it and quickly run a thumbnail down it to slit it so you can jump into your vehicle. Same if you discover a door/window leaking dust inside during an alpha blow, just seal it with the painter's, leave a tab for removal or use your thumbnail to get out. How much Reflectix do you think I'll need for the RV? I think it's 26', not 28'. If we follow your instructions, which I plan on printing because you are amazing and so is all of that, do you think we should still get Aluminet or something similar? Any idea how much Reflectix we should get? Get enough for all the windows. Can’t know till you pick up the RV. Brand names matter and you get what you pay for. 3M may cost more but it is true to spec and has published specs. Avoid no-name bargains like the plague. That will depend on the size of the windshield and the windows, skylights and roof vents. Find the model, get the window sizes, then calculate the square inches. Reflectix comes in various widths and lengths. The major benefit of Reflectix is in shielding the windows, skylights and roof-vents against heat, directly from the sun or radiated from the baked playa ground or the hot air (which is why you also cover North windows). This will make most RVs in most years usable during the day (more so if the Reflectix is on the outside), with an occasional boost from A/C or a swamp-cooler. There is still heat conducted through Reflectix, but at least it is insulated to reduce that rate. Having the RV under a shade cloth (Aluminet) structure means you've removed a good percentage of the direct solar radiation before it hits the RV. This is great. But it's a partial block of direct solar radiation, and it doesn't address the heat radiated from the hot ground nor the hot air, nor direct conduction of heat from the hot air. A shade structure with sides helps with that. RVs are large. A shade structure for an RV will be large. A few people have reported using Reflectix outside on the RV's roof and/or on the RV's walls in the sun. Installed with the usual tape. They report the RV being much cooler. This makes sense, as it reflects the direct solar radiation and the heat from the baked playa ground & hot air, and provides some insulation too, so reduced conduction from hot air and what portion that Reflectix can't reflect. Also, Reflectix reflects in the range 88% to 94% of radiant heat (depending on how crinkled); compared to a white surface with its best in the 38% range with select pigments, with most white surfaces much worse. You've already got the major benefit from Reflectix by covering windows, etc.. But the more of the RV surface covered by Reflectix, the less heat that gets inside. I think you'd get good bang for your buck by installing Reflectix on the East side of the RV against morning sun (for more sleep-in time), and the roof, at least over the sleeping area. The roof will be getting baked through most of the day. The angle of the sun at solar noon means the South side would benefit too. And depending on when you'd be using the RV, the afternoon and evening use would be helped with covering the West side. Due to addressing both direct radiation and radiated heat from ground & air, this should be particularly effective and cost effective for something the size of a passenger van. As with large windows, I'd be taping pieces of Reflectix, not the edges of a whole roll across the roof or along a side. In addition to reflecting the sun at everyone walking by and having people calling "It burns! It burns! ", the reflected heat can be baking your neighbours sleeping structures. Your RV may be less welcome in a camp. If you do an extensive Reflectix wrap, consider (or be prepared to be asked) parking in the outer rows, so you can be some distance from immediate neighbours. Some people take a can of white Krylon spray paint, so they can mist a surface that's baking an immediate neighbour. This reduces the reflective benefit of the Reflectix, but you'd still have its insulation value, and wouldn't be baking your neighbour. tape/seal the seam on the inside. That way you get the best heat rejection possible for the fixed side, while retaining the ability to quickly open the window from the inside (emergency use, or those moments when fresh air can be let in). This was the best year I've had for RV prep/cleanup. 90-120 minutes of prep, mostly on playa except for the moving blankets I laid down all over before we left to protect the seating/sleeping areas plus the floor. Spent 60-90 minutes taping on playa with 3M blue painters tape and covering most windows with reflectix 2 rolls (24"x25') covered everything with plenty to spare (27' RV). I did have a small gap at top of windshield but it wasn't worth getting a 48" roll just for that. While on playa, we did almost no cleanup but very limited shoes going in the RV and always worked to keep the door closed. The moving blankets stayed on the seating/beds/floors the whole week. Once we returned and emptied everything, I took a shop vac and went over most if not all surfaces and got as much dust as possible out of all the cracks and flat surfaces. Once that was done, I used dry swiffer pads to wipe all surfaces, shop vac'd again and another swiffer round. That got 99.9% of the dust off with no issues. Finally the interior got a wipe with bleach wipes to do a final clean. By doing the double shop vac/swiffer process you don't cake the dust onto the surface when you get it wet first. For the exterior, I took a leaf blower and went over every surface 1-2 times. Wiped all the seals and places with caked on playa with swiffers until it was loose. Then another run over all the RV with the blower. This included the engine bay. Once I felt like all the major dust was removed, I took it to one of the self service car washing places with pressure washers/foam brushes and spend about 45-60 minutes between the various functions spraying the whole RV with tire wash, pre-wash, then soap, and finally foam brush. Drove it back to my house (15 minutes) to dry. There was a little dust around the exterior of the vehicle from water running out of seams and stuff, but RB didn't charge me anything off my deposit and he stated it was one of the better RV's he's seen return from BM. I think the cleaning would have been even easier had they given me the RV with no slide out as I requested. I am going to be very clear next year that I do not want a slide out under any circumstance. I may also add some plastic wrap in a few places next year before I actually lay down the moving blankets, but all in all this year was super easy and effective. Hey folks, I've been readign a lot about reflectix and it's benefits. For an international traveller, where should I buy it and how much does it cost ?